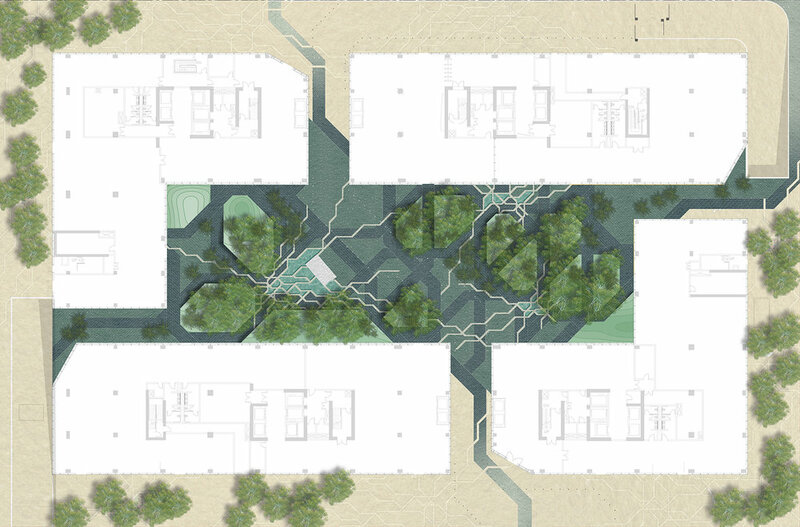 This project was generated as one of integrating landscape and architecture. Cascading down the hillside of a woodland sanctuary, Bedford House is a renovation of a 1950s weekend home on a 4-acre site that abuts a 225-acre nature conservancy. Organic and synthetic materials - wood, stone, concrete and plants - link interior and exterior, interweaving landscape, pool, and main house. 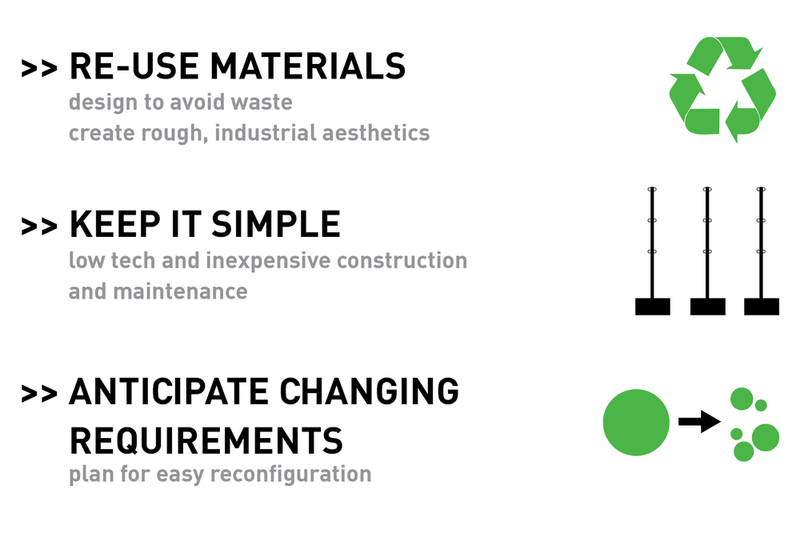 Materials are the connective tissue. The white concrete surface continues from inside the house to outdoors, interlocking with bluestone pavers and creating a path that leads down to the pool terrace. The white concrete surface folds up and cantilevers over the pool terrace to form the pool house, while field stone retaining walls dynamically wrap the pool house and make the pool into a sculpture. Bands of vegetation undulate across the front and rear of the property, unifying the site before dispersing into the forest, in a composition that changes color with the seasons. 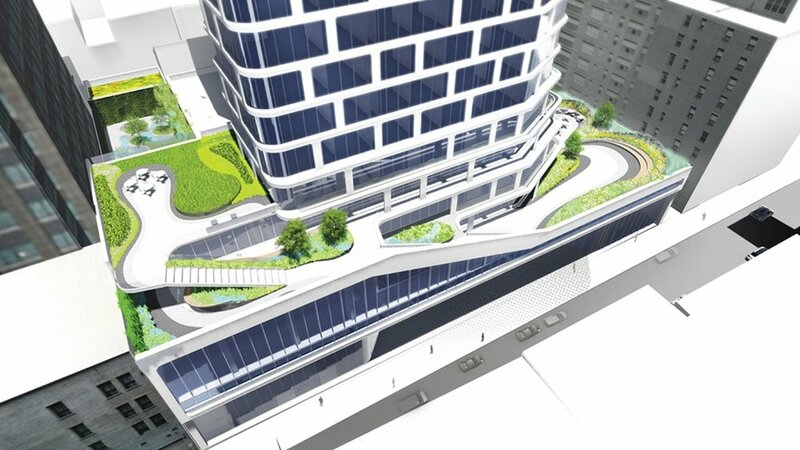 A series of daylighting analyses determined the plant selection for Soho Tower. 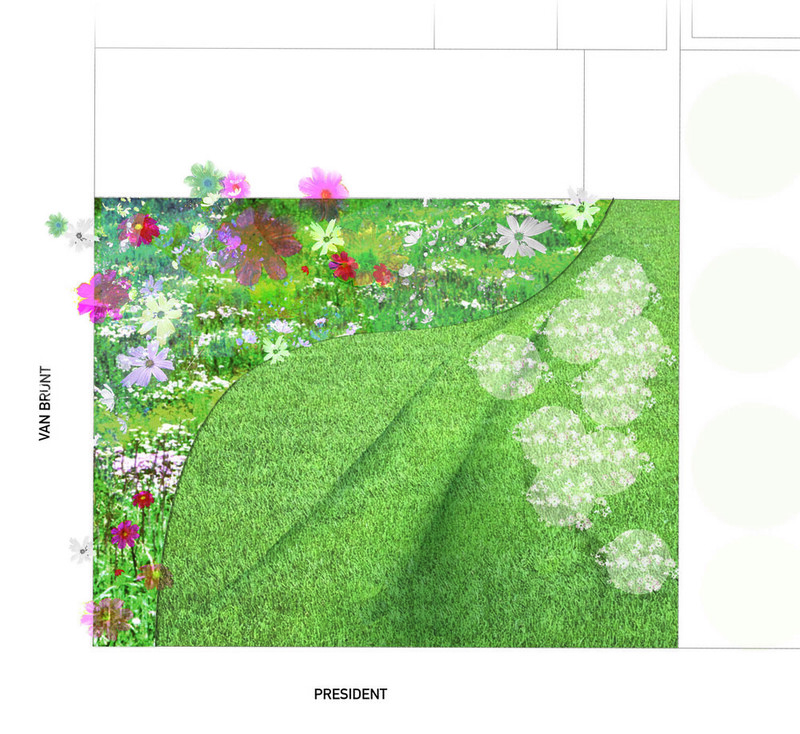 Climbers, understory trees, and mosses were selected for the drop off while at the terrace by the spa we designed a palette of prairie grasses that would allow for maximum privacy while framing the view from the indoor pool. 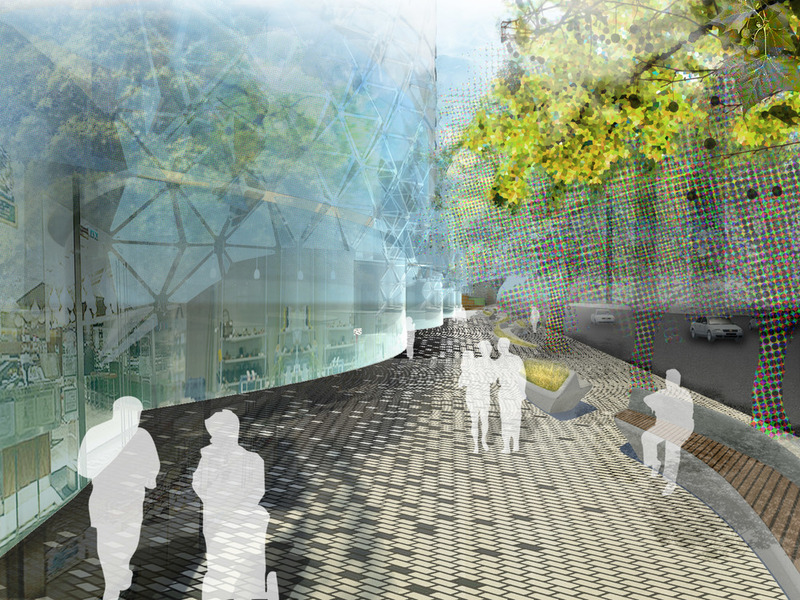 Black olive trees and jasmine were selected for the atrium. 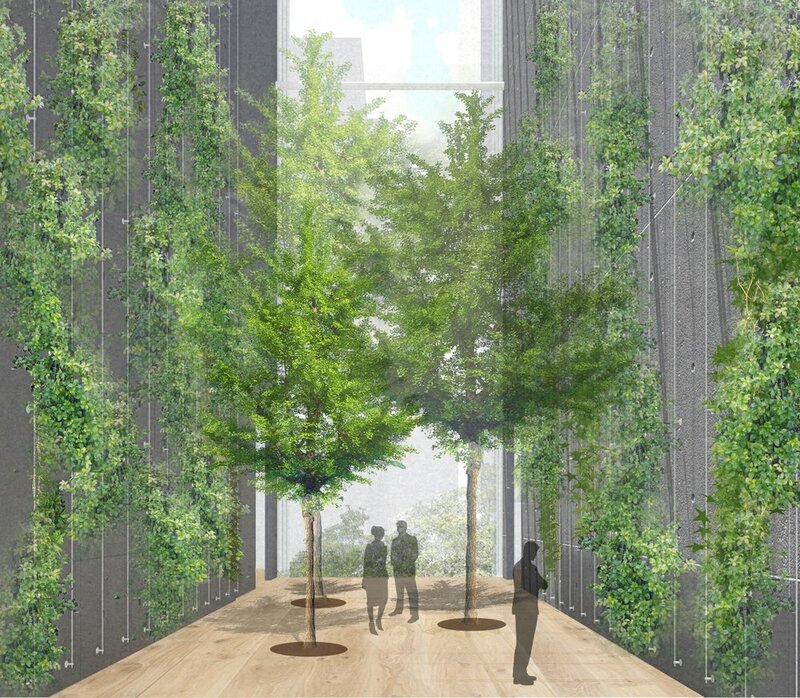 The winter garden functions as the lobby and reception area of the Iberdrola Tower. To enhance the character of the space, we selected three ancient olive trees. These trees, treated as sculptures, will emerge from a landscape composed by desert flowering plants. 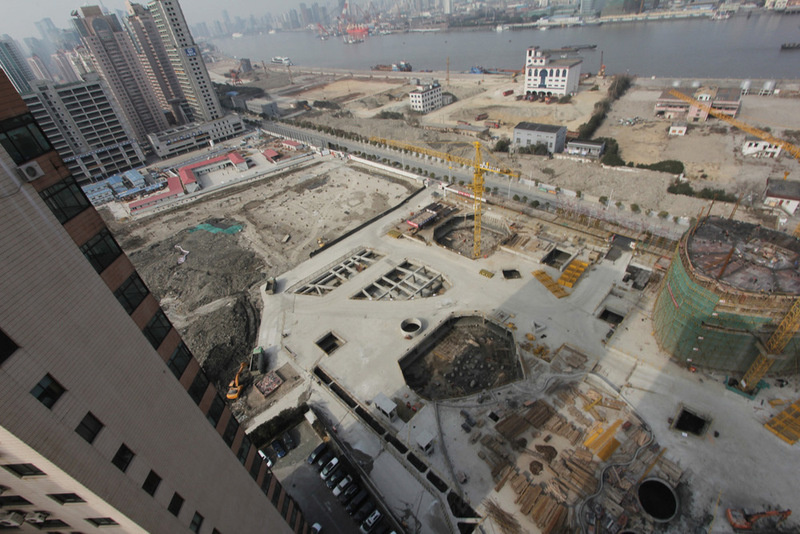 The public plaza around the tower has been designed over a submerged parking garage. This roof garden reads as the continuation of the surrounding landscape of the Campa de los Ingleses Park, also designed by Balmori Associates. The tower is LEED certified and all the water arriving to the site will be treated. 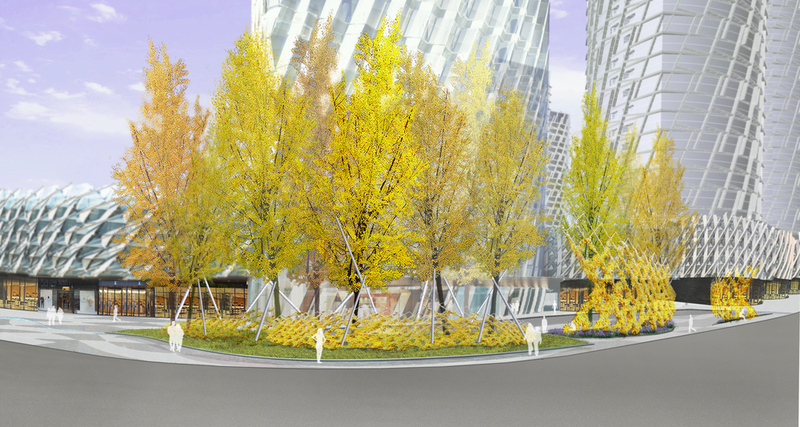 There is a bioswale surrounding the tower to collect, filter and clean the water arriving to the site. This is a fresh look at the ‘colonial garden’ for a 18th C. home in Newport Rhode Island. As a port city, Newport was a lively center for the import and exchange of exotic plants. Historic records of the lot revealed the colonial practice of planting orchards and the experimental grafting of fruit trees. Utilizing the time honored play of shifting perspectives and scale, this relatively small space for generous entertaining is transformed into a series of luxuriant garden rooms. 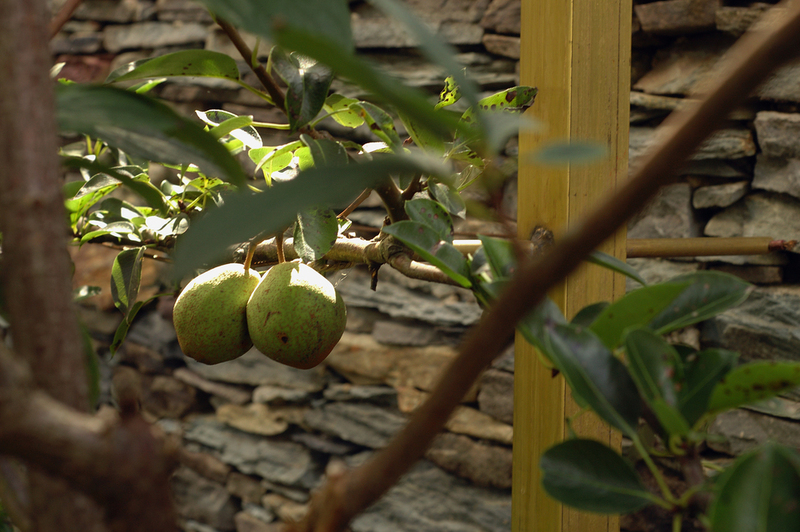 3-dimensional espaliered pears, bands of bluestone paving and gravel and plantings maximize diversity and provide the garden’s structure. 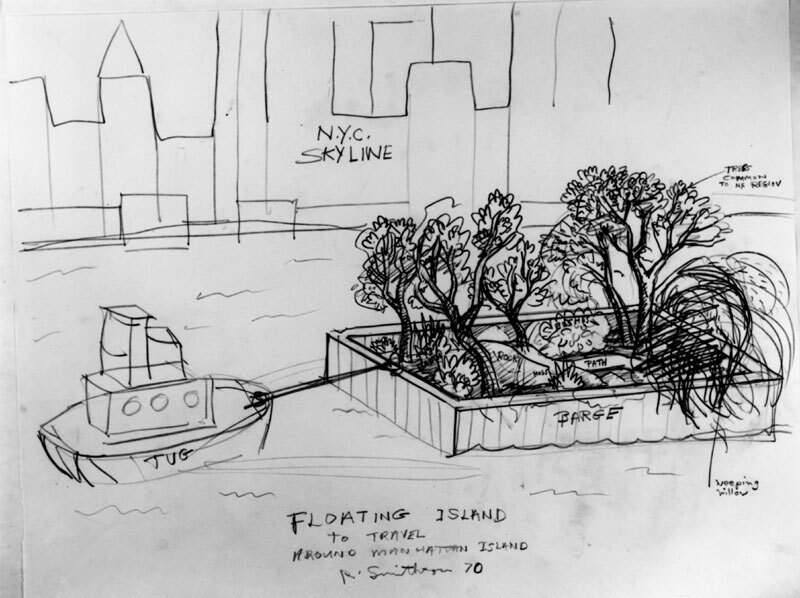 Two conceptual notions excavated from colonial garden history are exercised to inform the program and organization of the (Post) Colonial Garden. SOCIAL GARDEN (PARTY) is the act of cultivating a garden for entertainment and enjoyment and harvested as gifts. Plants are planted in bands with a seasonal and color coded ‘companion.’ 3-D ESPALIER SCREENS employ techniques of espalier, which first became popular several hundred years ago in the walled medieval gardens of Europe. Few or no fruit trees could be grown in these walled gardens because of the limited space available. Following finely crafted stone walls, the espalier screen creates a 3-dimensional version of the traditional espalier while providing depth and transparency in the garden. New York City-based landscape design firms XS Space and Balmori Associates have transformed an 8,000 square foot vacant lot owned by The New York City Department of Parks and Recreation into a verdant meadow with gently rolling hills of grasses, wildflowers, and flowering trees in downtown Brooklyn, NY. 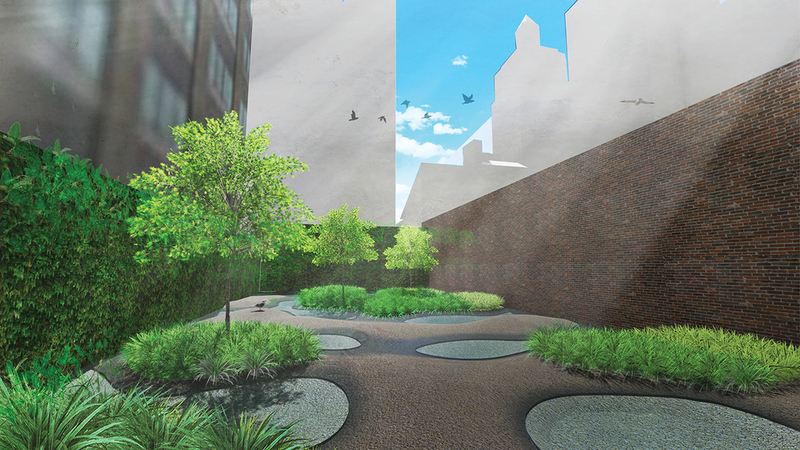 Initially conceived as a temporary landscape, this project received such overwhelming support by the local community that the New York City Parks Department adopted it under the auspices of its Community Garden “Greenthumb” program. 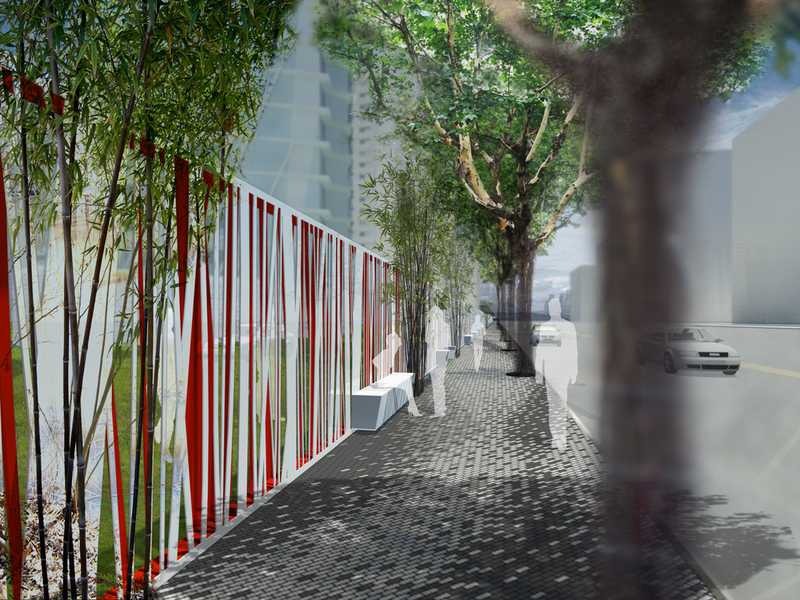 Since the completion of the design and installation by Balmori Associates and XS Space this summer, this new park will be maintained by local residents. Two large signs posted at the entrance to the park enumerate the environmental benefits of this newly vegetated site’s footprint on the environment. 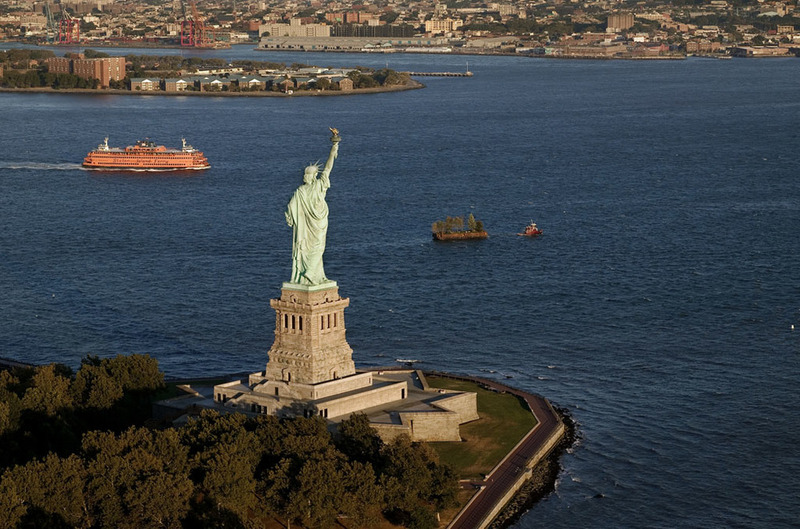 Scientists from Columbia University’s Center for Climate Studies were asked by the designers to study the impact of this site on surrounding air and water pollution, the Urban Heat Island Effect, and resulting health problems for NYC residents. The scientific data they collected quantifies the site’s increased capacity to absorb storm water run-off, offset carbon emissions, and create a cooler microclimate. 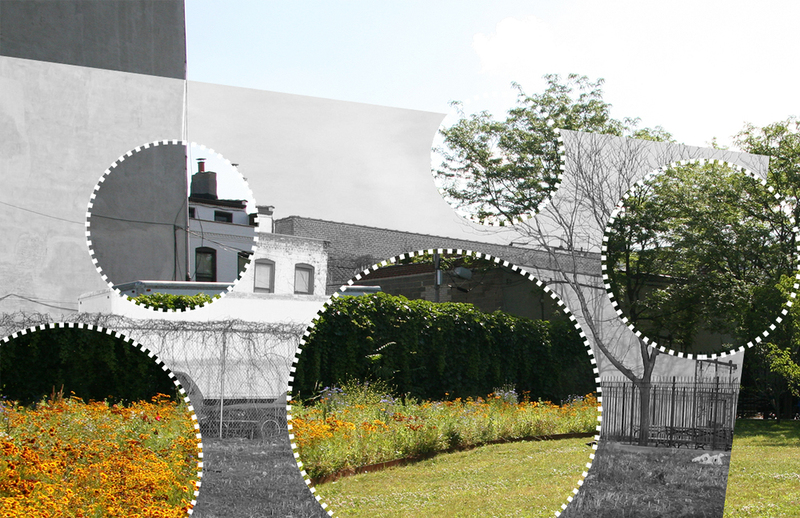 Urban Meadow BKLYN marks the launch of an ongoing collaboration between XS Space and Balmori Associates exploring innovative ways to temporarily transform vacant urban lots into productive green spaces. 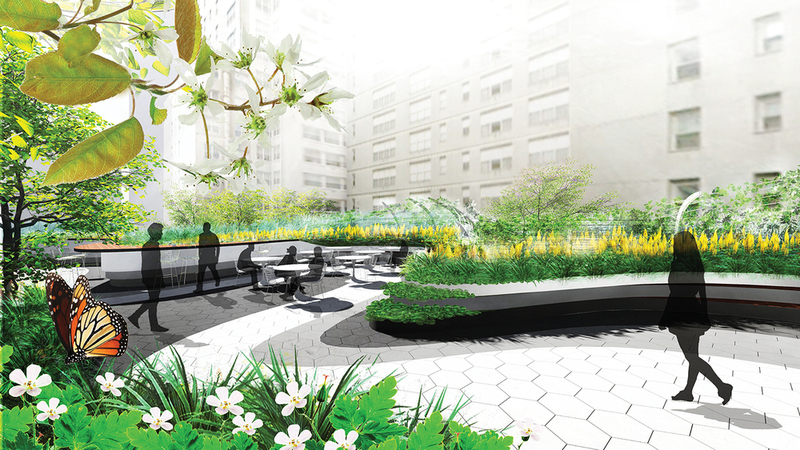 The landscape design firms are currently pursuing a proposal 5 LANDSCAPES / 5 BOROUGHS proposing a landscape project in each of New York City’s five boroughs. This proposal directly addresses Mayor Bloomberg’s PLANYC 2030 to reduce global warming emissions and provide easily accessible green space to every NYC resident. 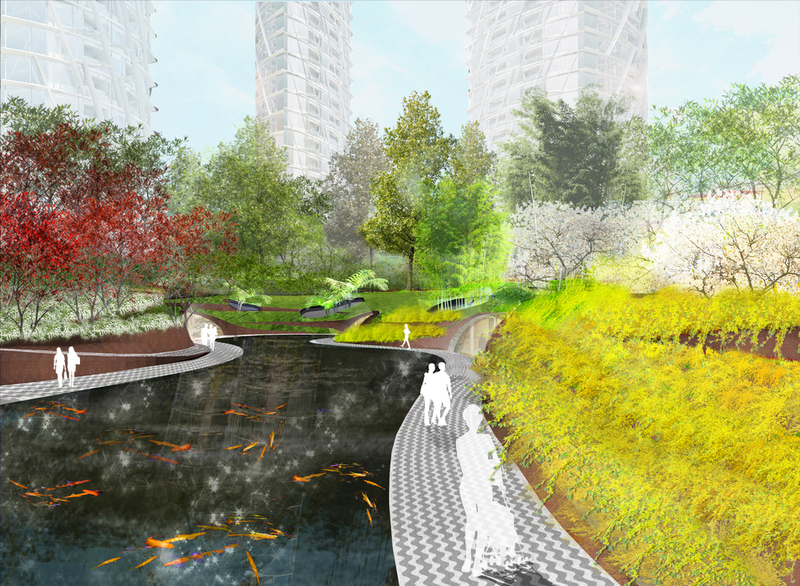 The designers are currently meeting with Community Boards throughout New York City to develop a list of potential sites for these landscapes. The design team is seeking sponsorship by various foundations, non-profit organizations, private corporations and developers. Two critical parts of public space use need a fresh look: the places and ways of sitting in it, and the places and ways of walking on it. 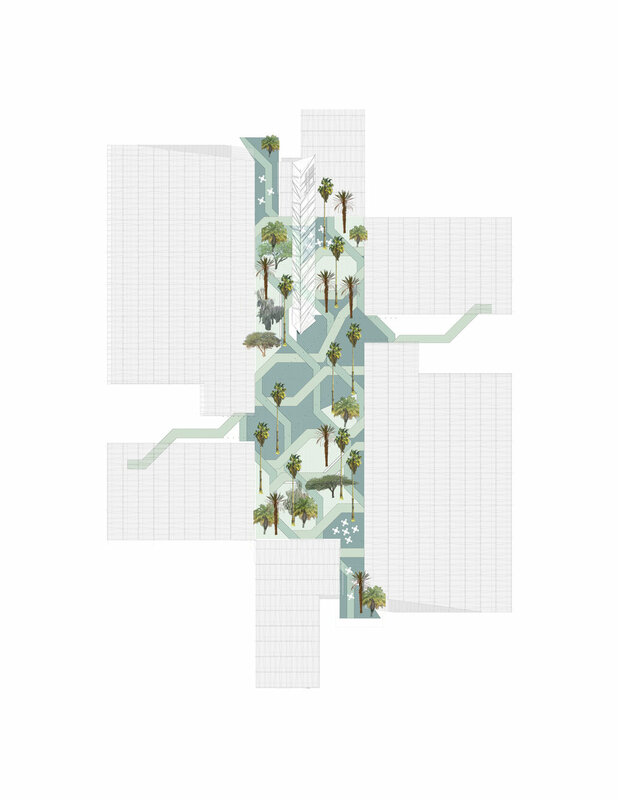 We have become very interested in playing with these elements and the piece that we produced for the “Dome Colony in the San Gabriel’s“, for Fritz Haeg’s two month long exhibition at the X Initiative Art Space was a way of playing with seating and planting. 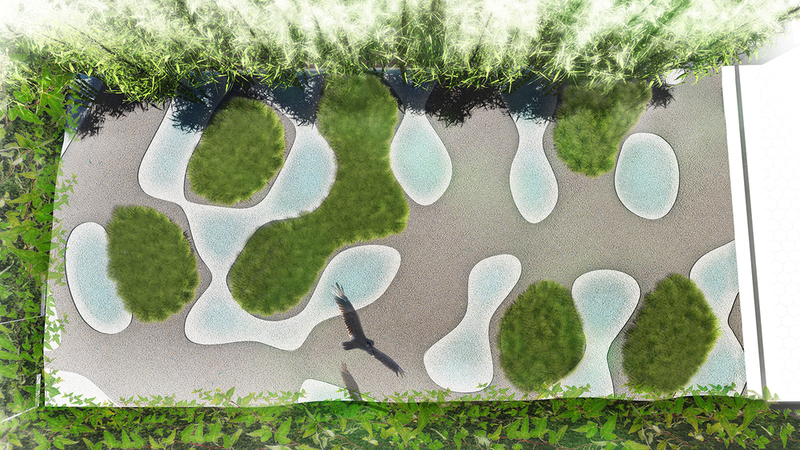 Envisioned as dynamic space and furniture piece; in form, it is a garden that engages the Colony. It is not only designed for visitors to move and play with, it is a social community space that invites them to linger, and just be. Can you work with some units for seating which people can assemble themselves (varying the height closeness to others etc.)? Using this as a premise the units allow you to make nooks where one person can be alone, or some can be for two or a large group. We named the experiment “nooks” for this reason. 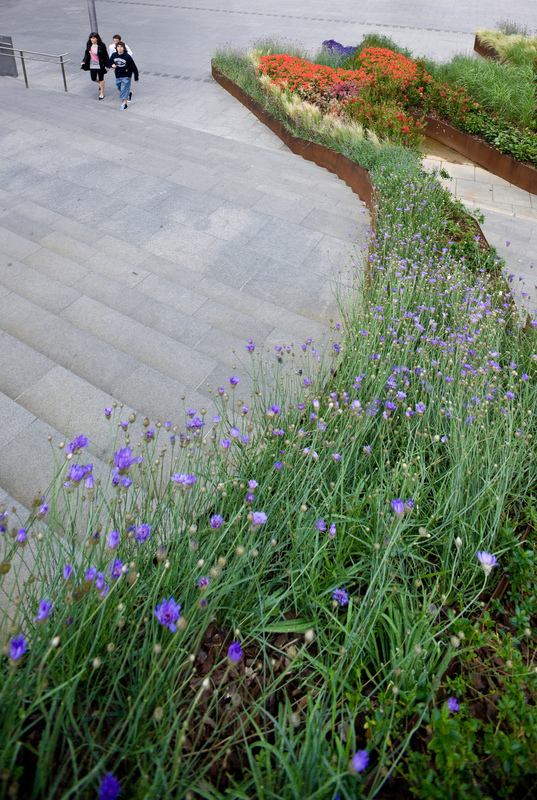 The secondary idea grafted on this was if plants could be incorporated into the system. 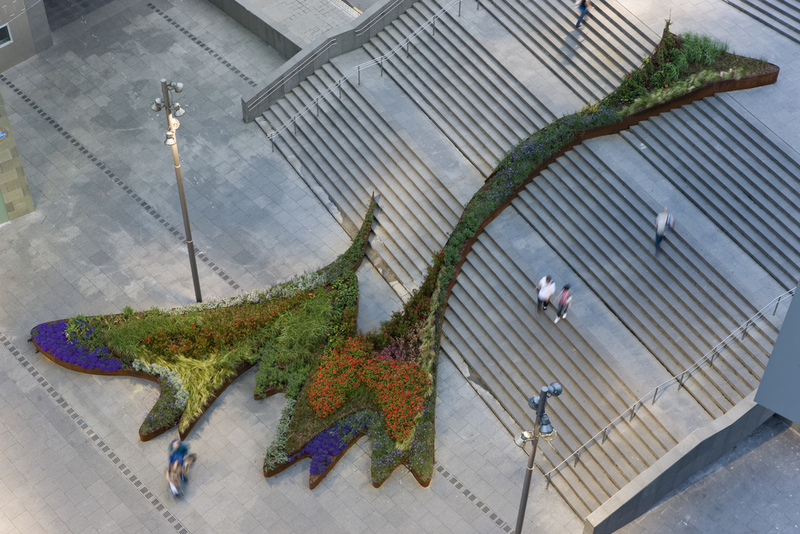 This time they are shown conceptually by providing paper flowers that people can plant in the space. 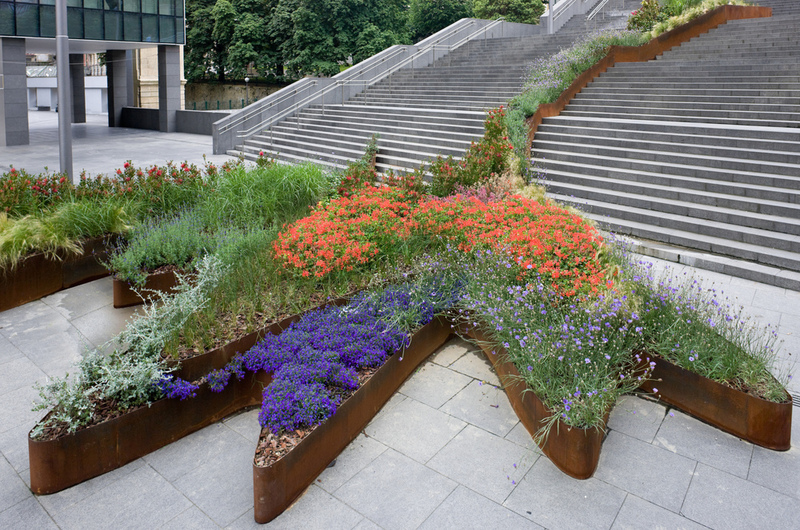 The Garden narrates a story of landscape taking over and expanding over the Public Space, therefore changing the way that the space is perceived and read by the user. The users that “plant” flowers in it, transform it with time. 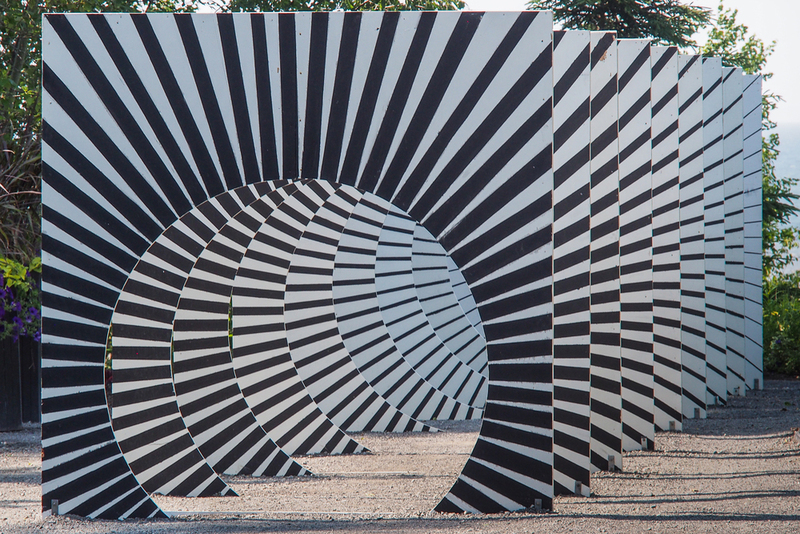 Governors Island is at the southern tip of Manhattan, an island is one hundred and thirty -two acres, half of it a historic park with old military barracks and handsome buildings, which are scheduled to remain, the other half open for proposals. 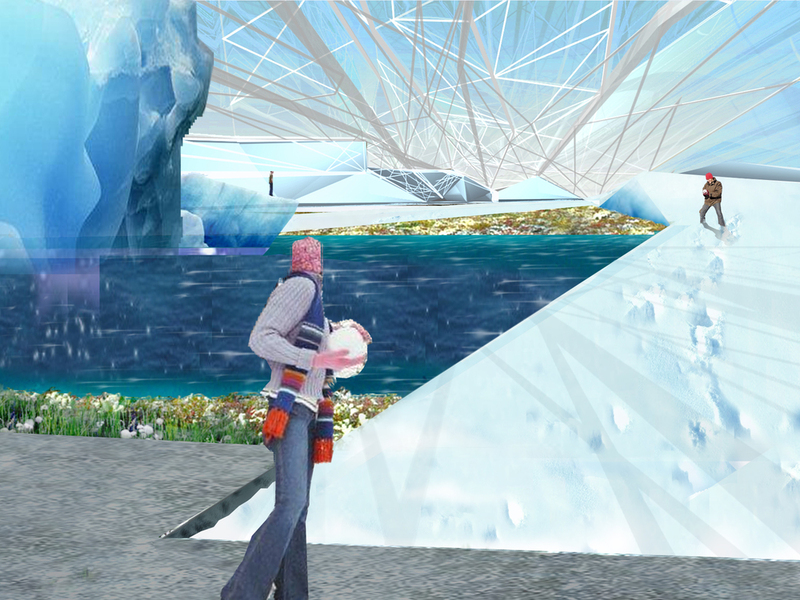 The island ‘s separation from Manhattan required stepping up it’s open space attraction, so we designed three glass structures, or biomes. You can enter one of these in winter and experience the warmth-and - light-rich atmosphere of a desert in a glassed-over desert landscape. Imagine New York city in the middle of winter, when the cold winds bite, our fingertips freeze and snow quickly turns to brown slush. Who would not welcome the opportunity to shed their layers of clothes and bask in the dry desert sun just 5 minutes away from the city. Now imagine New York City in the middle of summer, when the humidity is restless and the air stagnates. Would you not enjoy retreating to a dry climate where a breath of fresh air is only a short ferry ride away. Another biome consists of a tropical lagoon, also for winter enjoyment. 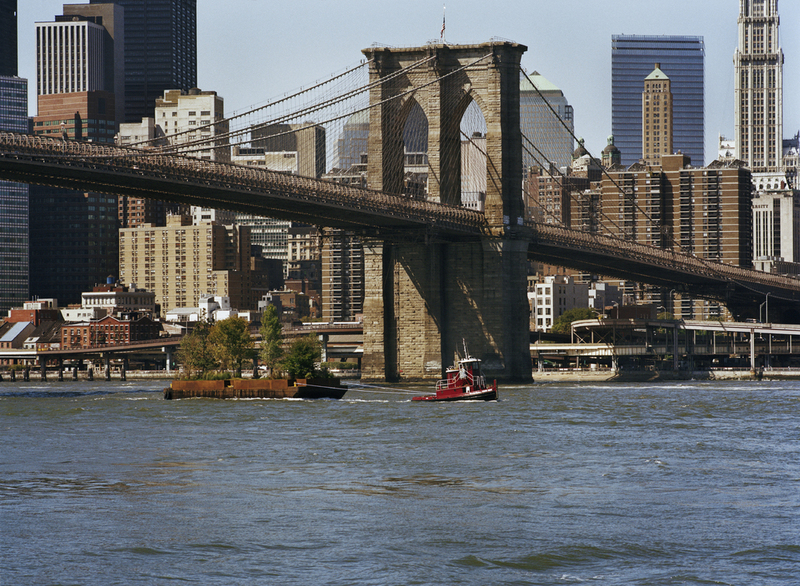 Some people call New York a concrete jungle, where the diversity of people, the constant flow of energy, and the variety of places compose an intricate network of life. 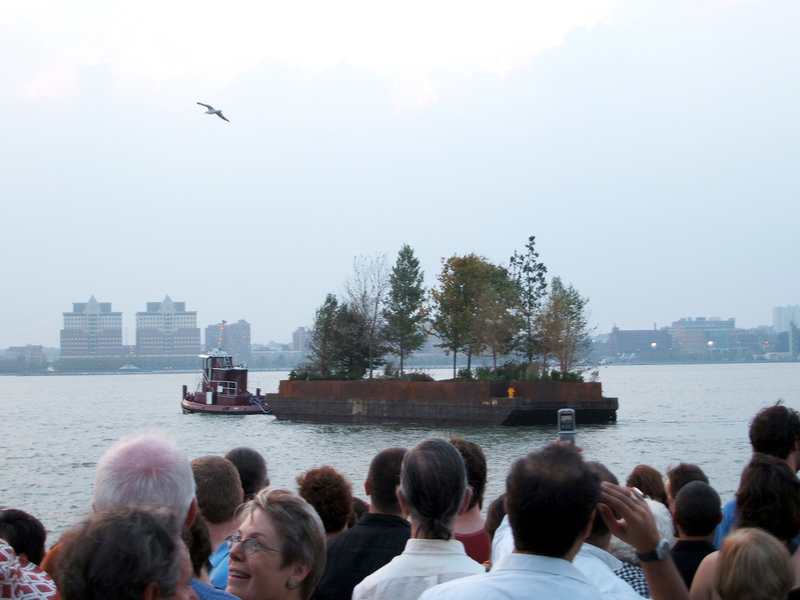 Here in the rainforests on Governors Island, people can experience another kind of jungle, one of tropical delight. 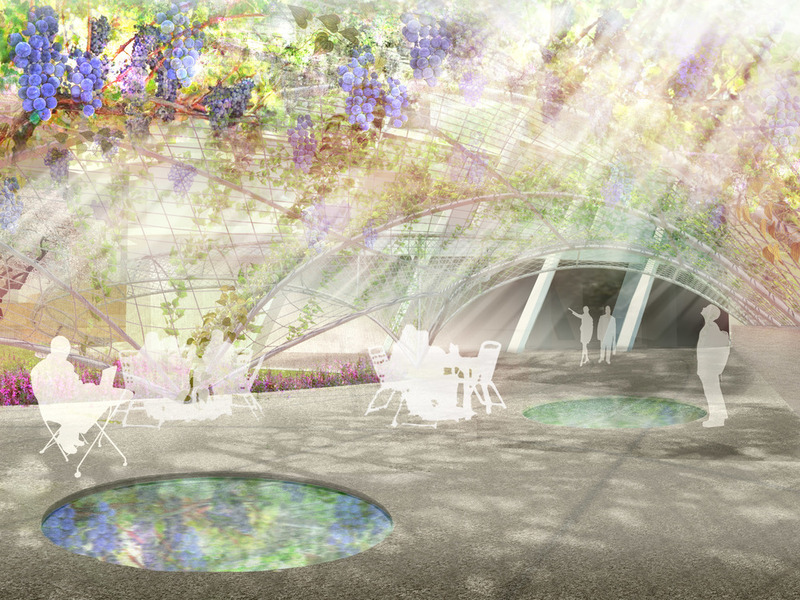 Here visitors will be enclosed in a temple of forest trees, draped with vines and exploding with tropical flowers. As you move from the smell of fertile on the ground through the warmth of the moist air to the canopy walkways, the layers of the rainforest each respond to different light conditions , from darkness on the forest floor, to the draped sunlight through the middle section , up to the bright and airy tops of the forest. The last is an Ice house with icebergs and tundra vegetation, where you can go in summer. 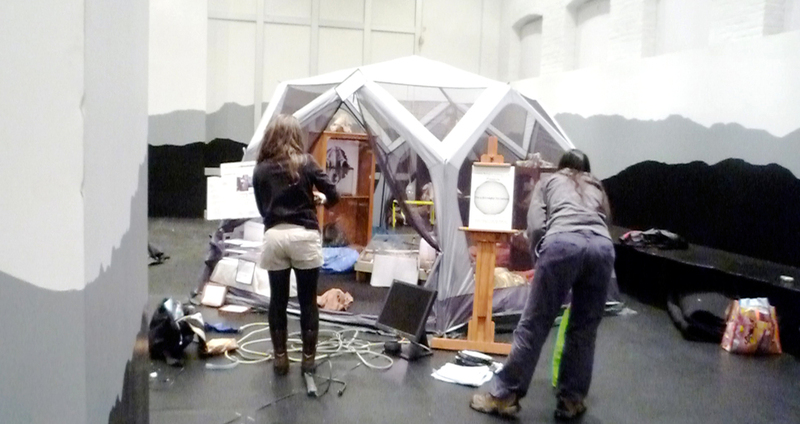 The arctic climate of the tundra recreated in New York’s backyard, will be the grounds for both curious scientist and tourist to commingle. Here visitors will be invited to explore the delicate lichens and mosses that cover the rocky landscapes and peer into the various pitcher plants of cold waters. The sculptural foundations of snow and ice will provide a sanctuary of light. In colder months, while you must keep your jacket on, the Tundra will offer a different winter experience from one we are normally exposed to. 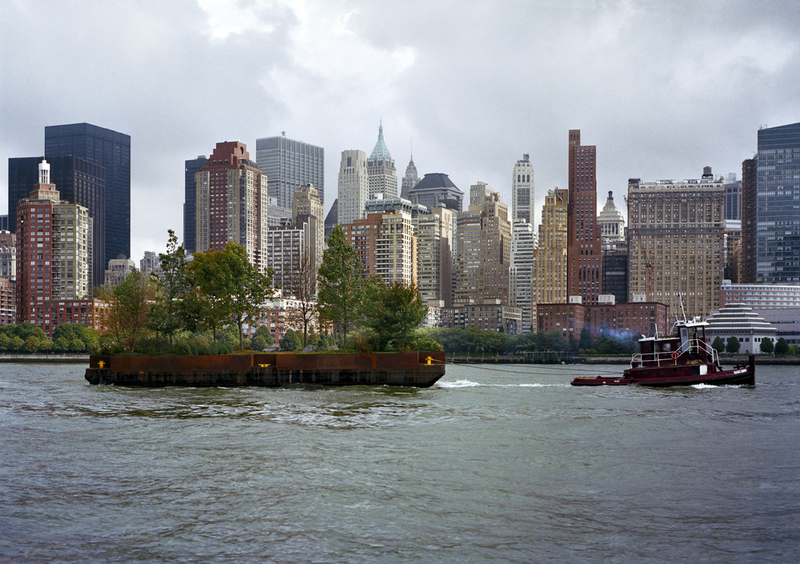 Park, beach, boating, farm and garden would fulfill other open spaces desires. 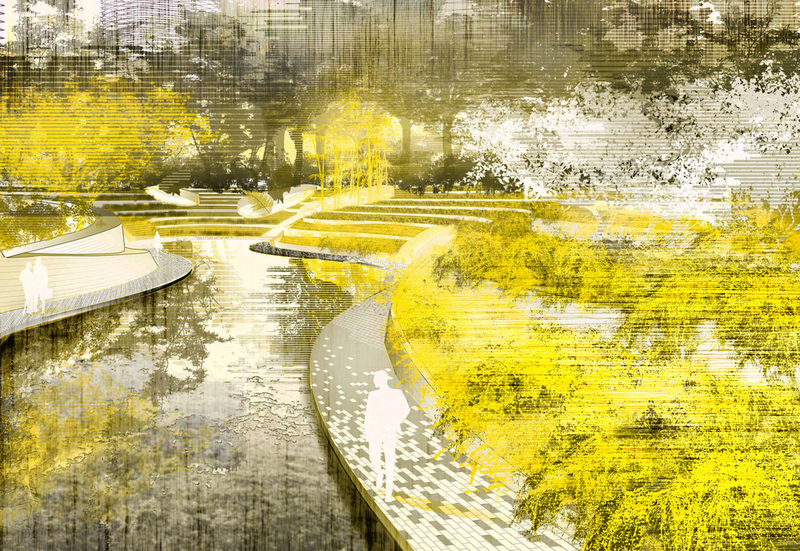 But the biomes would ply a role of connectors, providing experiences much different from those offered by most city parks. The Habitat Project will also celebrate the native and cultivated vegetation of the Hudson River valley by providing a special area for research and education. From sustainable technologies to urban agriculture, they are in the center of the island will be designated for agricultural development. The public will be able to take courses in organic farming as well as purchase some of the produce grown on the island. This area could also provide the restaurateurs, in the historical district, with fresh produce and herbs. The Cranbrook Academy of Art was established in the early part of this century as a complete artistic community embodying the ideals of the Arts and Crafts movement. 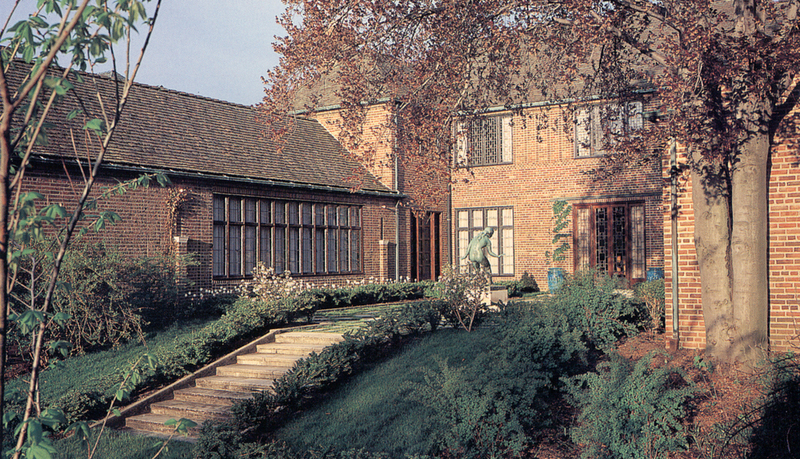 Eliel Saarinen, the community's architect, designed a house and garden for his family on Academy Way. Both house and garden had fallen into disrepair and have been recently restored. 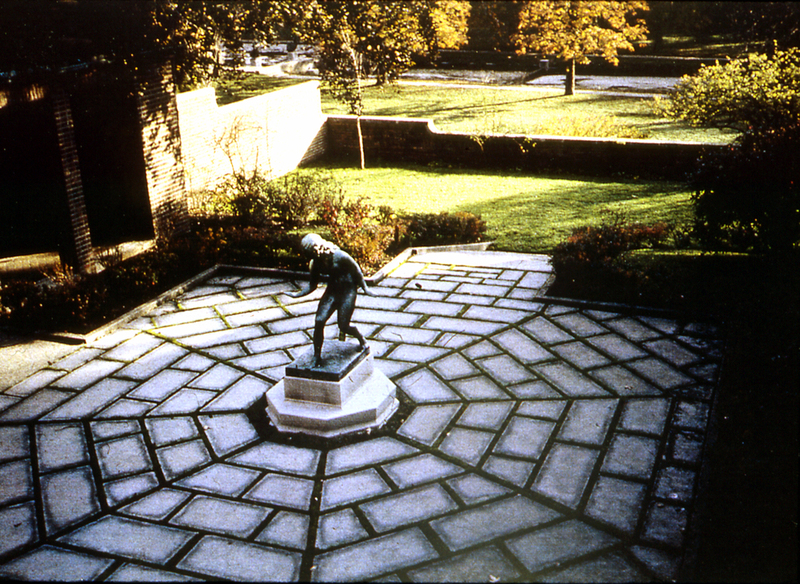 Balmori Associates, responsible for overseeing a full restoration of the garden, studied many historical sources to guide the restoration design including an early garden plan, most likely drawn by Saarinen; photographs of the academy from the 1930’s and later; and various archival films. In addition, the plant palette of C. DeForrest Platt was determined from his original planting plans and informed all planting decisions.